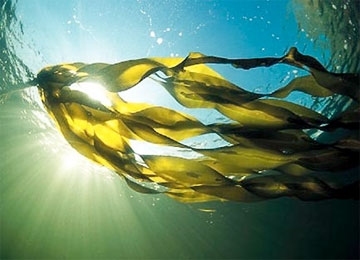 Did you know that seaweed could be used to produce ethanol? I read an article this week about a biotech start-up, called Bio Architecture Lab, that has created a new genetically-modified strain of bacteria that is able to break down sugars in brown seaweed to produce ethanol. Apparently, seaweed is quite rich in sugar, and this quality makes it a good “biomass feedstock” (a.k.a. a source of biofuel). According to the article, seaweed doesn’t contain lignin, a compound located in a plant’s cell walls that is found in crops like corn and sugar cane. Lignin is what allows those crops to stand up. It is also very difficult to break down, which is why extracting ethanol from corn or sugar cane can require intensive effort. Without lignin, seaweed is much easier to break down. It does not compete with food crops for land. It does not require fresh water (And we all know the world has plenty of salt water right now. Research shows that 97% of the Earth’s water supply is salinated.). Seaweed can also help to clean the surrounding water by filtering out pollution, as well as agricultural and municipal waste. Bio Architecture Lab (BAL) has also found a low-cost process for harvesting this seaweed. Seaweed produces 50% more ethanol per acre than sugar cane and three times more than corn – all at a much lower cost. Wow, sign me up! Sounds almost too good to be true, right? Well, it’s not without its challenges. Today’s industrially available microbes are not able to metabolize alginate, which comprises half of seaweed’s sugar content. BUT, a few ocean microbes are able to metabolize alginate. So, the BAL team, under the leadership of Yasuo Yoshikuni, combined one of these marine microbes with E. coli (a widely used microbe – apparently it’s less scary when it’s not in your food) to create this new hybrid bacterial strain. BAL also added an ethanol-producing component. This new strain has been shown to achieve 80% of seaweed’s theoretical sugar yield – a substantial improvement over traditional methods, but it still leaves room for improvement. Of course, using seaweed on a massive industrial scale will require years of work and investment. However, BAL has already set up four seaweed aquafarms in Chile, and China is growing aquafarms on a very large scale. Seaweed is a fast-growing plant, so aquafarms can be cultivated fairly quickly. I know that any new fuel source will require time, money, and effort to realize a new nationwide system of processing and distribution. But, this idea seems to me to have real merit. It uses a readily available and highly renewable resource and creates fuel at a lower price than current ethanol production methods. If only we could take some of the subsidies given to Big Oil and give them to companies like BAL. Then we could see some real progress! **NOTE: Some will claim that ethanol is not a valid alternative fuel because it has historically not been able to reduce total life cycle greenhouse gas emissions. However, this finding was largely due to the land and energy required to produce the ethanol (from corn, in most cases) in the first place. I believe that this new method of sugar extraction and ethanol production using seaweed, which is much less energy-intensive, will actually be able to reduce total life cycle emissions and result in a positive energy balance. But, I welcome feedback and any new studies you have come across!